Scenic Setting! Steps to Beach! 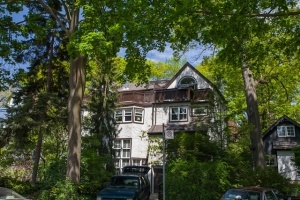 Intimate boutique condo building with only 6 suites located on a small dead end quiet leafy street south of Queen St. E. A nature lover’s paradise! 4 spacious levels of architecturally enhanced living space. Dramatic open concept principal rooms with towering ceilings and gigantic windows! Contemporary maintenance free living at its finest. Secluded master bedroom retreat amongst the trees! 1 car garage and extra large separate storage locker. Truly feels like a house! Ideal for professional couple/downsizers coming from a large home. Well run building with on site property manager! Friendly neighbours always willing to help each other out. Very low maintenance fees. Just a short stroll to all the action on Queen Street East! The Beach is nature’s wonderland of Lake Ontario, ravines, mature trees and the marvellous Boardwalk and one of Toronto’s most popular tight-knit neighbourhoods. Situated just one block from the beach, the Balmy Beach Canoe Club and the Boardwalk…The Beach is one of Toronto’s most popular neighbourhoods, with a lakeside resort feel and numerous recreational opportunities. Surrounded by million dollar charming homes accentuated by tree-lined streets that wind their way down to the lake. The social centre is nearby Kew Gardens, which hosts many annual events including a major jazz festival and a Christmas Tree and Menorah lighting festival. Consider to be one of the most family friendly neighbourhoods in Toronto with wonderful schools! Balmy Beach CS, Kew Beach Junior Public School, Glen Ames Senior Public School & Monarch Park Collegiate Institute catchment of outstanding schools, Malvern Collegiate and Danforth Collegiate. Walk to public, private, French Immersion & Catholic schools & local community centres. Driving in and out of town is carefree with proximity to Lakeshore Blvd. E, Gardiner and DVP. Kingston Road allows direct access to Highway 401 East. Prepare to fall in love with this sophisticated multi-level exclusive complex with only 6 suites in total! This gorgeous and spacious townome has the WOW factor you have been looking for! As you enter the main floor you walk into the dramatic sun-drenched open living room with 2 storey high windows, soaring 15 foot ceilings, gas fireplace and mantle, hardwood floors, 3 sets of bay windows with shutters, coat closet and walk-out that leads to separate pathway to the parking garage. The second floor is fit for entertaining! Open dining room and kitchen overlooking the main floor! Walk-in pantry, hardwood floors, plenty of cupboard/ counter space, stainless steel appliances, halogen lighting. Walk-out that leads to the most unbelievable private terrace nestled in the trees. The perfect spot to gather and barbeque with family and friends! The third floor boasts a large family room with wood-burning fireplace, fun exposed brick accent wall, double French doors, hardwood floors and 3 sets of bay windows. 2nd bedroom/office has hardwood floors, glass block accent wall and halogen lighting! Modern 4 piece family bath with deep soaker tub and full-sized laundry room completes this level. Fantastic master suite oasis! Oversized master bedroom has a deep walk-in closet, broadloom throughout and 3 piece ensuite bath with enclosed glass shower. Walk-out to the private rooftop deck and enjoy the serenity. Built-in 1 car garage and large separate storage locker with built-in cedar closet!